Unemployment hearings are more complicated than they appear if an employer wants to win. Although the hearings are by telephone, judges follow strict evidentiary rules and apply statutory and case law when they render a decision. An employer that appears at a hearing without the experience of the Law Office of Kenneth Carp risks an unfavorable decision. At the Law Office of Kenneth P. Carp, our Bridgeton MO unemployment hearing attorney is uniquely qualified to represent your interests at an unemployment hearing. After representing thousands of clients over the past 20 years, Attorney Kenneth Carp, a retired Lieutenant Colonel with the U.S. Air Force, knows the legal unemployment process extensively. He is well versed in the unique characteristics of the judges throughout the nation and Missouri and has the confidence needed when working with the government’s administrative law process. During your unemployment hearing, which will occur over the phone, there are specific rules of conduct and permissible topics of conversation. Kenneth Carp helps his clients stay on topic and well informed of what is and is not appropriate during this important call. Hearings may vary depending on the issues, facts, documents, witnesses and other important factors. Unemployment law can be complex. It is imperative that you obtain legal representation from an experienced St. Louis employer unemployment attorney who understands employment law thoroughly. 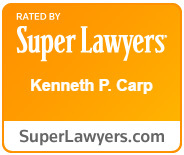 Kenneth Carp can help any business, large or small, meet the required burdens to protect the unemployment tax rate. Affordable legal services and personal attention are our highest priority. We strive to protect your unemployment tax account and save you money. Our commitment to the practice of unemployment law is an integral part of our success for you. Contact us and learn more about how our “continuity of care” philosophy will streamline your claim process and save you money on unemployment taxes.